Whether for Christmas or any other time of the year, international customers have the opportunity to pick up All Rolled Up‘s must-have gaming accessories through local retailers online. 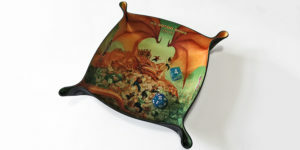 In the Australian territories, Imaginary Adventures offers a range of our game rolls and dice trays through their online store. We’ve had many customers in the past from Australia – it’s where Fil was born, so the connection is a close one – but, now you have access to a limited range of products without the delay. In Europe, we have had a long standing relationship with Roland at Sphärenmeisters Spiele – and we’ve really enjoyed getting the chance to meet him in person at Spiel in Essen. Sphärenmeisters Spiele has a wide range of our products and gets regular updates of new stock. If you’re worried about International Posting for Christmas, you have options!